Rohan Dennis jumps clear on the climb to Paracombe to take the stage and the time bonus, putting him in the ochre jersey. It was a slender lead but enough to defend on Willunga Hill two days later. The 2015 season has started with a tale of home advantage, an Aussie 1-2-3 on GC and local teams thriving. Dennis’s move shows the contradiction between cycling as a team sport and an individual one. He jumped clear and neither Richie Porte nor Tom Dumoulin could follow, perhaps they were cooked, certainly it meant riding in a headwind with Cadel Evans sitting on their wheel but this act saw the apprentice trump his master. However come Willunga and Dennis was the stronger of the two BMC riders, tracking Porte when nobody else could. The Willunga stage was crucial and enlivened by Astana who drove the pace on the last lap and briefly split the front group in the crosswinds. A curiosity or tactically significant? It did leave Sky floundering for a moment and might have cost Richie Porte some energy even if he played it cool in the chase rather than trying to close the gap solo. As for Porte, it could be agonising to replay the race, he was so close and a variety of scenarios could have delivered the win: going with Dennis to Paracombe, attacking earlier on Willunga and so on. Subtract time bonuses Porte and covered the course quickest, four seconds ahead of Dennis. But that’s anecdotal, Dennis won. UniSA – a combo team riding under the label of the University of South Australia – won two stages with Bobridge and Steele Von Hoff. Were they showing up the big teams? Superficially yes but don’t forget the context, Bobridge is in top form as he’s training for the Hour record after a summer while Steele Von Hoff is keen to get back into the World Tour and this is his shop window. So the combo of summer form and motivation/desperation means UniSA can pick some great riders. It looks bad for Cannondale-Garmin with their ex-riders thriving (Dennis, Bobridge, Von Hoff and George Bennett’s top-10) but presumably the team has bigger fish to fry in the coming months. We should note Wouter Wippert’s stage win too, a Dutchman but for the Drapac team. 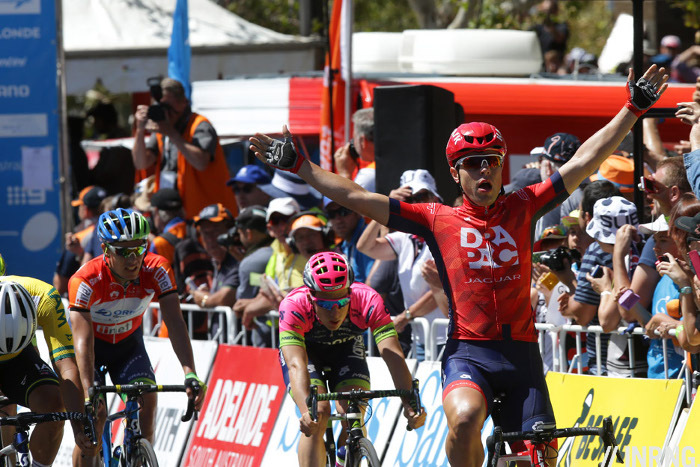 Drapac are progressing and finally get the stage win they’ve been chasing. Another triumph was the number of Australian cyclists out in attendance, the crowds are big with fans travelling long distances to see the race. You don’t tend to see this in France or Italy as there’s always a local race meaning no long journey’s necessary but it means many a European race is watched on TV rather than experienced by roadside congregation. An Australian clean sweep? Orica-Greenedge were left only with Daryl Impey’s points jersey but that’s bad luck on a course where Simon Gerrans could have thrived. We also got some of the first on-bike camera footage that matters. So far the content’s been viewable for its novelty rather than anything actually happening, sure we get a different angle for a sprint finish but even that’s been undermined by the GoPro fisheye lense which widened the gaps between riders. But Jérémy Roy’s freelance footage for Youtube captured a dramatic incident. He’s been toying with editing software and during the week and his daily output was fun but all changed when he got the finish line images of a massive stack. It makes you wonder if on-bike video is really the “crash cam” because other footage of, say, a solo win or riding in the bunch doesn’t tell us much. It’s a credit to the Tour Down Under that the peloton couldn’t engineer a win for Cadel Evans because this wasn’t a testimonial criterium, no rigged result. Perhaps it’s not the fairytale ending but fighting to finish third while passing the baton to a young compatriot and teammate is still a saccharine script straight out of Hollywood. Like all forward projections, you can better predict what will happen in a few days than a few weeks, yet alone months. Jack Bobridge is going to break the Hour record on Saturday. I can see Rohan Dennis doing it again too, he’s got a bigger engine but the Grenchen track in Switzerland might make it harder. 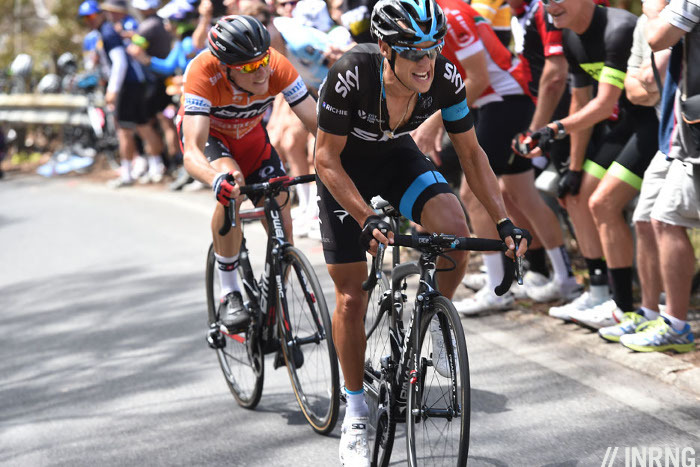 Looking ahead it’s too early to tell for Richie Porte and his Giro ambitions, he’s in an identical position to last year with second place, it’s a question of so far, so good. J-J Lobato’s got his eye on Milan-Sanremo and he can scale small climbs to outsprint the best while Tom Dumoulin can surely win a stage race this season; had the TDU included a time trial stage it would have been good to see him against Dennis. 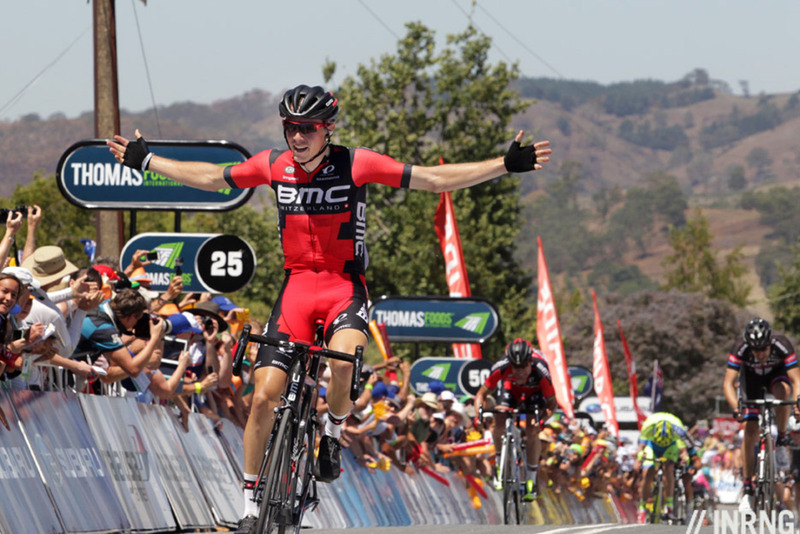 As for Rohan Dennis his story is a much longer term prospect but in 2015 can hope to challenge in other stage races, after this week the next test comes in races like the Tour of California, the Dauphiné and the Tour de Suisse, the summer stage races with high mountains. You might have heard the solipsism “if a tree falls in a forest and no one is around to hear it, does it make a sound” and again we’re left asking what happened in San Luis. The win of unheralded riders and the basic video content makes for few followers. Exciting racing and a worthy winner enlivened by entrepreneurial locals and invitees like UniSA. No longer is the race a sprint-fest where André Greipel wins overall, now the route is punchier than a randy kangaroo. This allows a wider cast of characters and as it’s the start of the season, we see new kits and shiny bikes. Purists who say “the season doesn’t start until Het Nieuwsblad” are missing good racing, with echelons and attacks, especially as it’s easy to watch with the action concentrated late in each stage. Sure it’s not the most significant race but even races like the Dauphiné and Tour de Suisse often get viewed through the prism of the Tour de France rather than celebrated in their own right. A good ride by him and an example of how once Team Colombia get a good rider they get poached by a bigger team. He did win a mountain jersey in the Tour Med early last year too. Good point on the team prize! The team prize matters to the World Tour points, no? The team really does benefit I think. And that brings out one reason why this race matters now. A DS can gather up a pile of points and know what he has for next year even sooner in the season. It would have an impact on who he will race and where he will race them during the summer. There are no UCI points for winning the team prize, although stacking the GC with riders can win points. But team managers do rate these prizes a lot, often more than most viewers. Maybe not the fairy tale ending that many were hoping for, but with Evans-Porte-Dennis finishing on the podium it was a fitting snapshot of the past, present and future of Australian stage racers. Dennis’ late attack was out of nowhere, I jumped out of my chair when I saw it! I knew Dennis won Alberta but every time I’ve seen him in a race previously, he’s smacked down well before the finish line, so it was great to see his persistence pay off. The commentary loved the close gap between Evans and Dennis and how the results were not exactly as planned (in a post-race interview Dennis said he was meant to attack earlier to wear out Porte etc for Cadel, but was caught up at the bottom of the climb at first). There really was no way they could have faffed around with the lead without any number of people grabbing the jersey and running with it, and I think everyone inc commentators knew that, constant fairytale references aside. 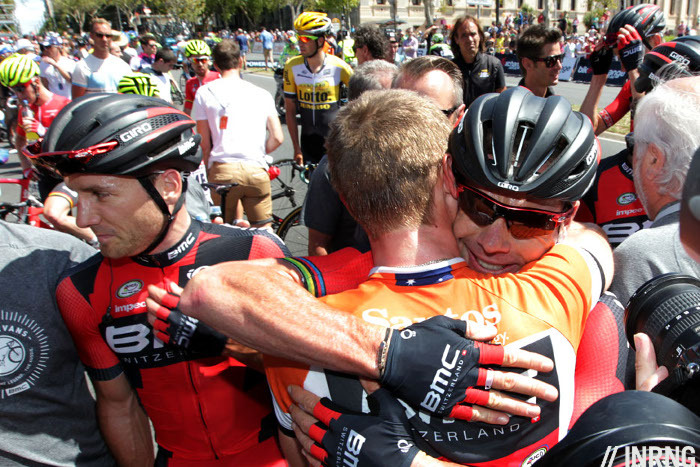 I was watching with a huge Cadel fan, and they were deliriously happy he got on the podium at all. The crowds might still seem smaller than some people might expect for ‘the big Australian cycling event’, but Australia is ridiculously huge and has very low population density outside the coastal cities (it takes at least a day to drive from the other capitals to Adelaide). Events like these typically aren’t things that a large number of casual/non-fans can wander down to watch on a whim. As Inrng put – many of us travel vast distances for this race – I certainly was not the only person from Perth at the side lines (about a 3 hour flight or two day drive). The number of cyclists there was incredible for Australian standards – we usually call a traffic jam a road with more than half a dozen stationary cars, there was 1,000’s of cyclists going up Willunga and the Paracombe wall prior to the peloton turning up. The centralization of the event (all the mechanics are housed in one place at the center of Adelaide, same hotel for the teams etc) works really well too for a short stage race. Great write-up, INRNG. I really enjoyed TDU, I have to say. Couple of points re Porte: Porte sat in the wheels whilst his team mates and other teams were chasing down BMC and Astana in those echelon, so I doubt it used up his energy tbh. He did explain the reason why he didnt attack earlier on Willunga…I just have to find the interview where he said why…. Lastly, he’s in a bit of a better position that last year: Aus TT title under his belt, and 2nd on GC at TDU instead of last year’s 4th. And his Willunga performance was even better than last year. But of course its what happens when he comes back to Europe to race that counts…. Exciting week in Australia for sure. 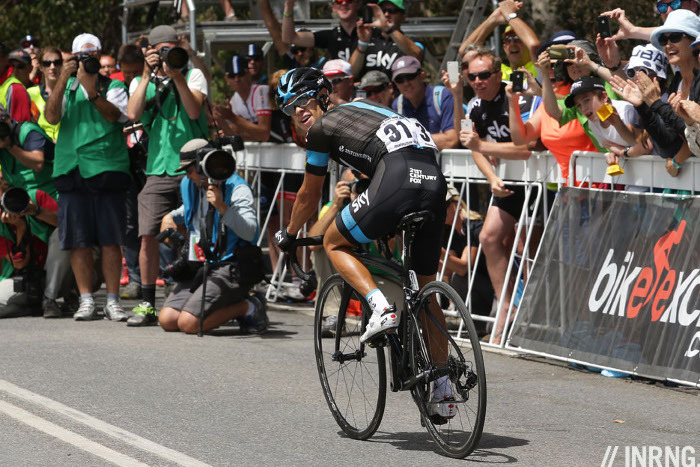 The moment when Porte attacked on Willunga and all the big names jumped on his wheel was pretty amazing. Dennis attack on Paracombe was a surprise and i belive that if Sky were in better shape generally and set a better pace on climb (Thomas disappointed me but if he’s really looking forward to Vuelta this year then it’s no surprise at all he doesn’t have a shape in January) Dennis would never catch back the leading four and would not win the race. Bonifazio and Fernandez are two guys who can really step up this year. Thomas is going for the classics again (not sure which races….) so should be in a similar shape to last year, however he’s not in his “best shape” as he has been maybe 2 or 3 years ago when he was targeting the overall in TDU. Pretty much a perfect TDU for the Aussies then. A potentially symbolic handing over of the mantle from Evans to Dennis and an all Australian podium encompassing an up and comer, career peaker and old guard. With hindsight an earlier attack by Porte on Willunga might have done it but in any case I think all credit has to go to Dennis, who I personally didn’t think would hang in quite so well. My greatest testament to the race is that I set an alarm and woke up at 3:30am to watch the Willunga showdown. You’ve just made my morning. The echelons before Willunga probably did more damage to Evans and Dennis than Porte. They were both working with Astana to extend the gap, and it looked like Sky had been badly positioned again again as the gap grew. However the peleton (20-30 max at this point) got organised and neutralised the move – Porte just sitting in the wheels, conserving energy. Ultimately Astana’s move was futile, but nontheless, good entertainment. Thanks for the article, inrng…. Just a small correction, Jack Bobridge is training for the world hour record, not the Worlds as you have said it. Cheers and keep up the great work. Love the site. I think you could definitely benefit from reading the comments on the previous post and drawing a distinction between your personal opinions and objective reality. Read ’em all sir, perhaps you missed reading the word CURMUDGEON in my post? 🙂 If “objective reality” was all we could post here, what would be the point of the comments? I have a tough time understanding why you take my (and others) comments about “pre-season” races (not just TDU) so personally. Are you the organizer of any of these? The word “curmudgeon” and some emoticons are not get out of gaol free cards. I, and others I imagine, have a tough time understanding why you feel the need to heap abuse on to races that in your personal opinion do not qualify for some sort of gold standard as part of the REAL racing season. If other people (including all the professional cyclists who race them) enjoy the events, do you take this as a personal insult to your view of what does and does not count as “traditional”? And no, I don’t work for the TDU or any other race. As I mentioned in my comments in the previous post, I see a lot of snobbery towards anything even faintly “new world” in cycling, and it’s a deplorable trait that should not be celebrated. Was thrilled to see Lars Boom taking up a role with his new team as ‘agent provocateur’, shaking up the peloton during a few stages! Good training for him! Looking forward to seeing how that develops during the season! Jeez, Craddock broke his sternum. Wonder if his chest hit his bars or the ground? Also, crashing on the ride to the hotel…imagine how many days of talking head debate would go on if some NFL player broke his foot jogging home from a game? Millions of Americans would lose their minds. Goddell might be burned at the stake, if it were a star. I love how cycling is largely ignored. Makes it that much better for me to follow. Seeing the pictures of Craddock he was doing the “collarbone clutch”, it looked like a classic injury. Hopefully the sternum fracture isn’t too severe. One of the great things with cycling is the accessibility, riders spinning back to the hotel after the stage or making their way to the start line. The advent of team buses has reduced this a bit but it’s still a big plus point in the sport. I will now keep a keen eye out for more footage from within the peloton from Jeremy Roy! @Esteban – if I may – I don’t think anyone is doubting the beauty of the Tour de San Luis or the quality of the riders there. The negativity comes from the fact that we can’t get access to the race. We want to see the beauty and the quality! It seems the riders are paid well to attend and they certainly enjoy it – Cavendish has praised the race and the organisation a lot – but not much money is put aside for filming / broadcasting, which is a big shame. I for one would love to watch Nairo riding the mountains of Argetina. But I can’t. Hm, as gabriele pointed out, it is a bit easier to watch than it used to be. Not only the coverage but the timing against a WT race and the language/nationality barrier (most of what I got was from Spanish accounts and tweets about Cav vs Gaviria) probably make it a bit too easy to underestimate San Luis altogether. Estaben’s comment is something we can keep in mind, even if inrng was being laconic and not outright dismissive. Next post: Pro Team Sponsors: What Do They Do? Previous post: The Right Race, The Wrong Time?